Most of our long awaited D&RGW and R.G.S. "K-27" Class Hybrid Models arrived on April 14, 2011. These have since been delivered to their new homes where they have been received with great anticipation. Comments like "Congratulations P-B-L! You have outdone yourselves, once again! It doesn't get any better than this! "; and "I unpacked and ran the first two Hybrids today. I knew that they would be more than good, but I have to hand it to you, they are fantastic. I think you have to stay with cast frame on future projects, they run like silk! "; and "thanks for a great model and for what I think is now THE standard. I bet all of the detractors are crying in their pretzels! "; and "Truly, far more than I expected! These things are an outright bargain! My only regret is I wish I had ordered more!" 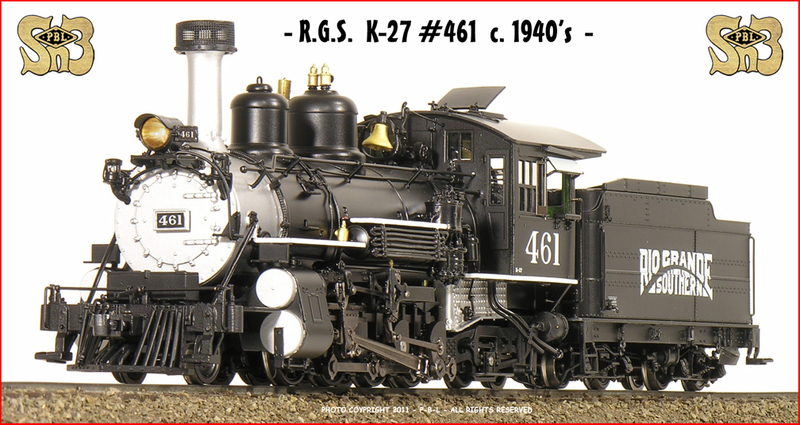 These models feature the ideal marriage of a precision Diecast frame for super-smooth reliable operation, and a handmade brass superstructure which afforded us the opportunity to accurately detail each of the 5 different locomotives included in this amazing model run! A sampling of these models are featured on this page. Come and see for yourself ! We're P-B-L. This is the kind of stuff we're known for ! PLEASE NOTE: THIS PAGE CONTAINS SLIDE SHOWS. PLEASE ALLOW TIME FOR IT TO LOAD COMPLETELY FOR THESE TO DISPLAY PROPERLY! BOTH AS 1940's ERA AND 1930's ERA MODELS ! It also has a separate locomotive mounted lighting decoded in it that allows us to keep the loco-to-tender wiring down to a manageable 4 wires... This gives us its operating headlight, plus operating marker lights, operating tender back up light, cab interior lighting, and flickering firebox lights. All controllable independently..."
This is Foreground Model Engine number 453 c. the 1940's. Click on the photo for additional, enlarged views . This is Engine number 453 c. the 1930's. There are numerous differences between this one and the 1940's version. Click on the photo for different views . This is Engine number 454 c. the 1940's. Click on the photo for additional, enlarged views . This is Engine number 455 c. the 1930's with green jacketing. Except for the green paint our "Standard" version looks the same. Click on the photo for different views . This is Engine number 455 c. as it looked after it went to the R.G.S., and before it was wrecked. Click on the photo for different views . Engine 456 c. the 1930's with the irresistable green boiler jacketing. Click on the photo for different views. Engine 456 c. the 1940's and outfitted for switching duties. Click the photo for different views. Here is Engine number 459 wearing a 1930's style paint scheme: Black jacketing with "Graphite & Oil" to protect her smokebox and firebox areas. Click on the photo for different views. Engine 459 circa the early 1940's, also known as the "Transition Era" when mixtures of heralds and paint schemes were prevalent. Click the photo for different views. This is Engine number 461 c. as it could well have looked in the 1930's when somebody at the shops cared enough to paint her boiler jacketing green. This is Engine number 461 c. the 1940's and wearing the "Flying Grande" paint scheme. Prior to being sold to the R.G.S. Click the photo for more views. This is Engine number 461 c. the 1940's after being sold to the R.G.S. "Rising Sun" Herald and all. Click the photo for more views. This is Engine number 463 c. as it looked during the 1930's. Click the photo for more info and views . 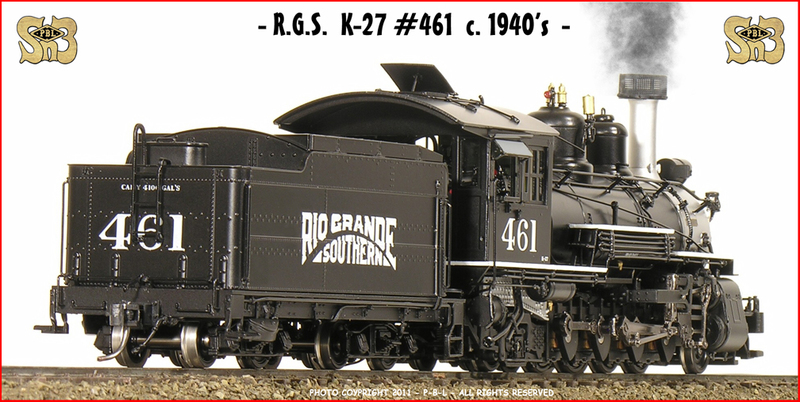 This is Engine number 463 with green boiler jacketing and the 1940's and later "Flying Grande" paint scheme. Click the photo for more views. Precision Die Cast Locomotive Frame & Tender Underframe. Genuine Canon CN-22 Motor for Smooth, Powerful, Reliable Operation. Fully sprung mechanism for reliable power transmission to track. Full Factory Painting and Lettering per each prototype. Accurately modeled, prototype specific locomotive superstructures of Lifetime Brass. Operating Headlamps and Marker Lamps. Genuine Kadee Couplers, front and rear. Available equipped with PBL/PFM type Sound and Lighting. Minimum Recommended Radius: 26 Inches. Remember: The recommended MINIMUM RADIUS for "Sn3" is 30". The DESIGN MINIMUM RADIUS for these models is 26". THE HYBRIDS ARE HERE NOW. AND THEY ARE ALMOST GONE ! The few remaining are likely sold too. We are now awaiting responses from guys who had stand-by reservations. But since "stuff" occasionally "happens", you might give us a call to see if there's a remote chance one might still be unclaimed. But hurry! "Peter SUTTON was here, he has all of the Blackstone stuff. His comment was, You have to hand it to Ol' Bill, they are as good as it gets. "Any way, as much as I knew what I was going to get, just because I know the beast, thanks for a great model and for what I think is now THE standard. "I had a couple of guys here yesterday and they were blown away with the first two that I have received. They both ran as good as they look, PERFECT! "I bet all of the detractors are crying in their pretzels... Have a celebratory beer for me!" Georgs M. wrote: "My "Hybrid" K-27 arrived at the end of last week so I took it for a spin on the weekend. It runs exceptionally well, better than any of my earlier K-27's. Please count me in as a customer should you do another run (I'd like a 464 and perhaps a 452). And please pass my thanks to Bill, Mary Ann and Jim at PBL as well as the builder for a job well done." "My 4 K-27's came yesterday. Hat's off to everyone at PBL, they were definitely worth the wait. " "I want to take a moment to thank you for all the effort that went into the Hybrid K-27. I received mine last week and I am very, very pleased. I finally have a little time to run it in and plan some custom tweaks before crew , coal and weathering. You know those little things that will make it mine." "I've now received both my K-27s and they are more than I ever dreamed. Detail is fantastic, they run beautifully on DC, and well what more can you say?" "Bill-Keren-Jimmy-Mary Ann, UPS delivered my K-27 Hybrid RGS 461 today. After reading Ol Bill's instructions I set it on the layout. It ran perfectly from a crawl to top speed. The detail is superb. Placed it next to an older K-27 Foreground model (RGS 455 pre-wreck) and the detail is greater. K-27 has PBL sound and ran it with my PBL FSS II sound system.and it sounded fantastic. "Put 8 - 3000 series boxcars and a PBL 0404 brass caboose behind it and it pulled perfectly even at a crawl. One great model at a reasonable price. Received a 3000 series economy door boxcar as part of the K-27 purchase and the detail is out of this world even has Denver Griffin stamped on the coined wheels. Rolls beautifully. You guys have done good. The K-27 was well worth the wait. You'll have to go some to top this model." "My K27 #454 is and runs beautiful. I have run a 11 car consist around my 200' main line with 15 turnouts over 20 times without a single derailment. My grades are 2% with 30" radius curves. The lights are working perfectly. I am a very happy camper! "I do want to pass along to the crew up your way that you've all out done yourselves with the hybrid K-27s. I got home yesterday from Europe and was able to open the box (nicely packaged by the way - kudos to Mary Ann on that one). WOW! I know PBL's work with brass but this is a great new chapter for the hobby. I set one up on my desk to admire before I returned it to it's box. Lovely, just lovely. Can't wait to set it on track and let 'er pull some of the various cars that now litter my shelves. Got to get cracking on setting up that layout..."
"Just received my 456 Hybrid. All I can say is WOW! What a beautiful engine, very nice details and it runs the way it looks: beautifully! You all did a nice job designing it and Boo Rim building it. "It was worth the wait. "I also greatly appreciated the RTR box car that came with it. A very nice touch. "From my email, you can see I am happy! "IT IS A SUPER A++++ MODEL- WE ALL SHOULD BE HAPPY AND IT IS WORTH THE WAIT!" And the list goes on and on and on.... Thank you Guys! For believing in us! Call us at 707-462-7680 to talk to a REAL PERSON ! Really !